Happy New Year! If you weren’t aware, January 23rd marked the beginning of the Lunar New Year. This is the year of the Dragon so if you have a little one on it’s way, consider yourself very lucky! People in Asia are expecting a “Dragon Baby Boom” because the sign is considered to be especially blessed with luck and strength. It is one of the most auspicious signs in the Chinese Zodiac. If you happen to be in the Los Angeles area, there is a New Year Festival going on in Chinatown. It looks like a lot of fun for the kids. There will be lots of performances and booths, and if you’re a foodie, there will be some gourmet food trucks there as well. Something for everyone. The kids LOVE to take the train so as a bonus for them, we will hop on the MTA Gold Line in East L.A. This way we don’t have to deal with the many street closures and trying to find parking, which will probably cost as much as our train tickets. Basketball season is in full swing for my 6 year old. It’s so much fun watching the little ones play, mishaps and all. My son has finally figured out which hoop he is supposed to shoot at! 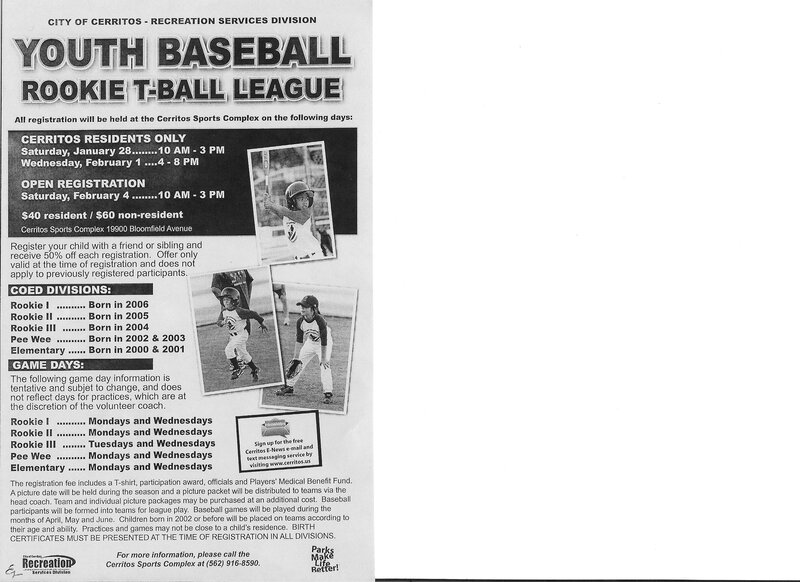 The league is sponsored by the City of Cerritos Recreation program. My son has participated in all the sports through the city and I think they are a wonderful platform for any budding athletes. Today is also the first day of registration for baseball in the spring. Please see attached flyer for all the details. Today my toddler and I had a field trip to Heritage Park. Of course it happened to be the hottest day of the winter–80 degrees in January! Sometimes we take this park for granted because it happens to be our “neighborhood park”, but it really is one of the most lovely parks in the area. It has several picnic shelters, which you can reserve for parties up to 3 months in advance. It costs $100 to rent and they require a $100 deposit. I believe this policy applies to all the parks in Cerritos, except “Cerritos Regional Park”, which is run by LA County. The crown jewel of Heritage Park is the colonial island based on a Paul Revere theme. The island is centered around a colonial village, which is actually a playground. There are monkey bars and slides all housed in the little “shoppes”. At the peak of the island is a “church” with a bell tower which actually houses a tunnel slide. Surrounding the island are ships and landings where the kids can pretend to shoot cannons, cross bridges galore, and even see a few turtles. There is also a beautiful waterfall running through the island. It’s such a scenic spot that you can always find photographers and their subjects here on weekends. Helloooooo out there….this is a very surreal experience. I have decided to start this blog because when I became a parent for the first time, I couldn’t find any information for activities in and around the Cerritos area. Most of the information for parents focused on either the West L.A. area or Orange county area. That’s also why my blog is named Mother on the Edge–because I’m right on the edge of Los Angeles County and Orange County…and also because I’m ready to go over the edge at any second running after my two kids. After my son started school is when I learned about the greatest resource of all: other parents! All of these wonderful parents who I have had the pleasure of meeting have shared so much information with me and I would love to pass this information on in the hopes of making life just a little easier for everyone. Thank you so much for reading my blog! I am ignoring my kids trying to figure out how to create this blog. Please be patient…thank you for your understanding.